The BioStim SD Digital TENS Unit is a compact, extremely durable and portable unit that measures 3.9″ x 2.5″ x 1.1" and weighs only 3.25 oz. The ergonomic design incorporates large 3/4" buttons that are easy to press. Requires prescription. 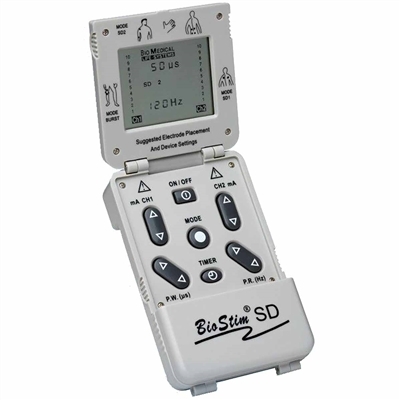 The BioStim SD Digital TENS Unit is a compact, extremely durable and portable unit measuring 3.9″ x 2.5″ x 1.1 in and weighs only 3.25 oz. Ergonomic design incorporates large 3/4" buttons that are easy to press. There are no small dials to turn enabling patients with dexterity issues to easily use. Strength Duration 1: Increase of set Pulse Width 40%, decrease of set Pulse Rate 45% and decrease of Amplitude 10% over a 3 second period. Values return to original settings over the next 3 second period. Strength Duration 2: Increase of set Pulse Width 60%, decrease of set Pulse Rate 90% and decrease of set Amplitude 13% over a 6 second period. Values return to original setting over the next 6 seconds. Cycled Burst: 2.5 seconds on, 2.5 seconds off. Adjustable Pulse Rate 1-200 Hz. Adjustable Pulse Width from 10-250 μs. Dimensions: 3.9″ x 2.5″ x 1.1"
Lead wires are durable easy to handle and install. Stores last setting used by the patient. Patient Lock System: Prevents the patient from changing any of the set parameters. Patient Compliance Meter” is displayed showing how many hours the device was used.